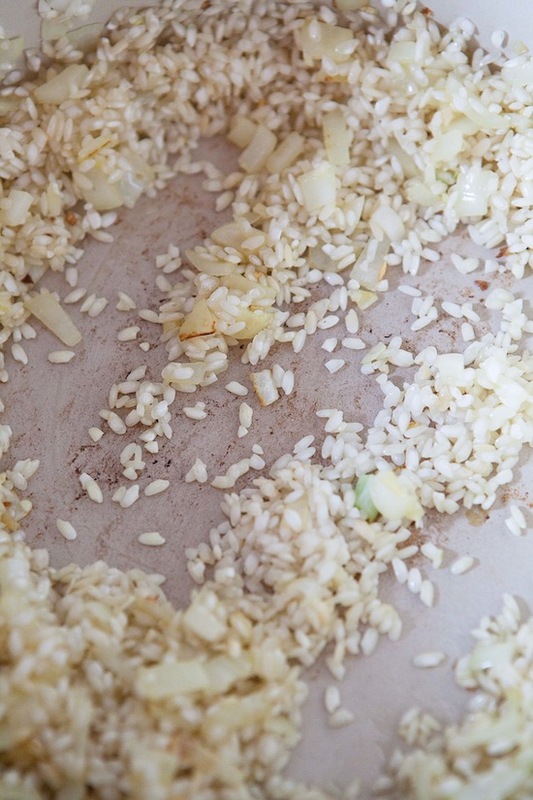 So, with that taken care of, let us turn to the risotto. I’d write this off as being related to my lemon addiction, except that Joel says the same thing. And he doesn’t have a lemon addiction. Thus, empirical proof that risotto should have lemon. 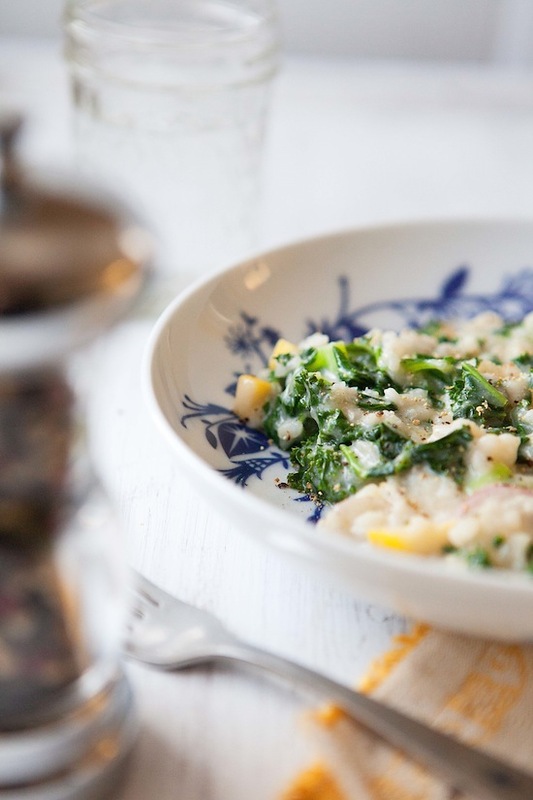 The loose and easy playful brightness of lemon is a champ at getting the stodgy starchiness of risotto to let down its hair and join the party. A little squeeze of lemon balances out risotto like nothing else. This risotto has basically a whole lemon, in preserved lemon form, chopped and stirred into it, which is probably why I am so very enamored of it. That, and it’s also bursting at the seams with radishes and kale. The rice can barely contain such a quantity of vegetables, and that, in my estimation, is a good thing. And speaking of “a good thing,” where would the idea for this recipe have come from but from Martha Stewart. I’ve never much followed Martha Stewart. The only reason I know she said (says?) “and that’s a good thing,” is because I had a French teacher in high school who would always try to mimic Martha Stewart’s voice and say, “et ça, c’est une bonne chose.” I haven’t much followed Martha Stewart, but I feel fondly toward her anyway. So, when I was hanging out at a friend’s house a couple weeks ago sort-of dog-sitting (long story that I won’t bore you with now) I seized the opportunity to flip through stacks of Martha Stewart Living. So many pretty things that I will never make or do in those magazines. So many. But, my eye was particularly drawn to a recipe for farro risotto with radishes, chard, and preserved lemon, and the idea stayed with me. As luck would have it, a few days ago we had not much for cooking with in the house besides kale, radishes, and lemons. And lo! there was risotto rice in the pantry (I used carnaroli, but arborio will work just as well). And so I decided to make my own expression of Martha’s recipe. I’m pretty sure this is one of those recipes where I try to recreate a dish and then completely change it in the process by misremembering the recipe. But that is how wonderful discoveries are sometimes made, and I don’t think I’ll ever bother making the original recipe – if I find it – because I liked this version so very much. As I mentioned before, lemon is Yin to risotto’s Yang, and preserved lemon adds something even more. 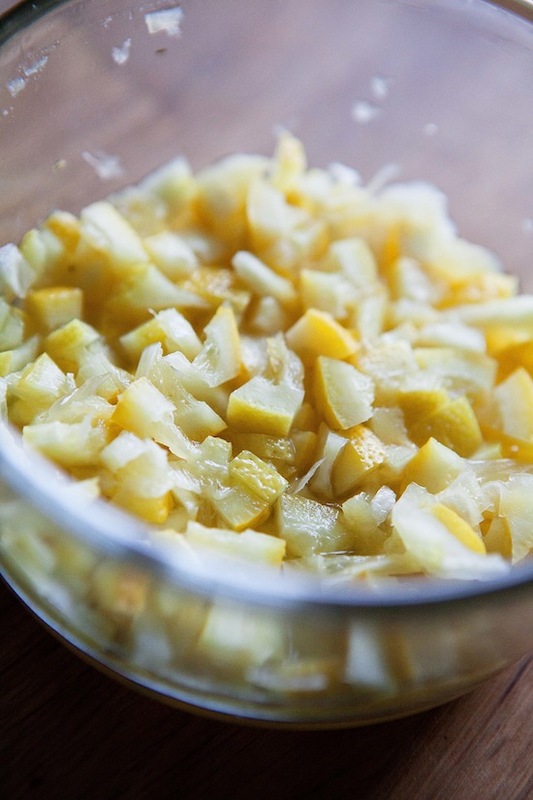 Preserved lemons take the flavor of lemon and somehow amplify and pacify it, adding bitter, briny, grassy, floral, and umami notes to the citrus you expect. 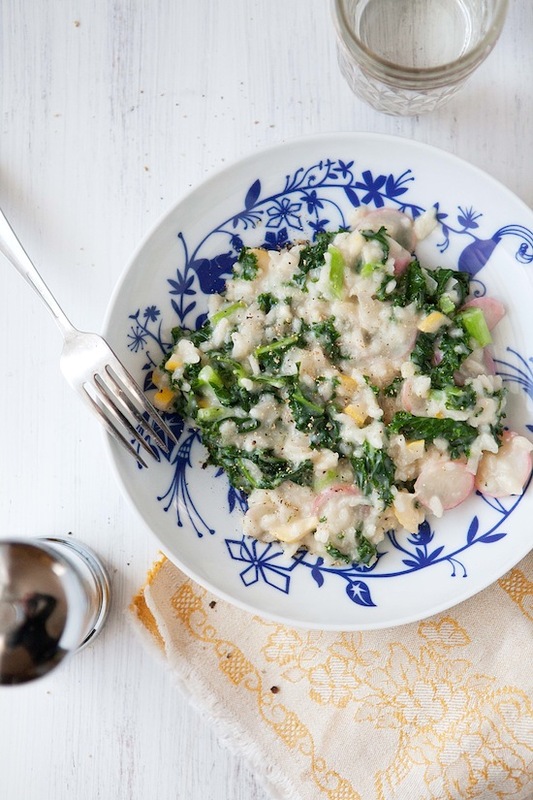 Then in every bite of the creamy risotto you find tender slips of sweet cooked radish and sturdy sprays of leafy kale. Delicate quantities of cream and cheese bring the flavors and textures to their satisfying conclusion. It’s light and filling, and a total keeper for spring. P.S. We’re also leaving tomorrow to be on the East Coast for a week for meetings. But, I’ll of course check back in on Monday to celebrate the new site design. Wee! Congrats on the blog makeover and url! Can’t wait to see the new blog! Great recipe, I always need a tang in a risotto – we had one last night with fresh spinach, asparagus and tons of parmesan. And, of course, lemon! I can’t wait to see the new site. I’m sure it will be fabulous! The risotto looks beautiful. 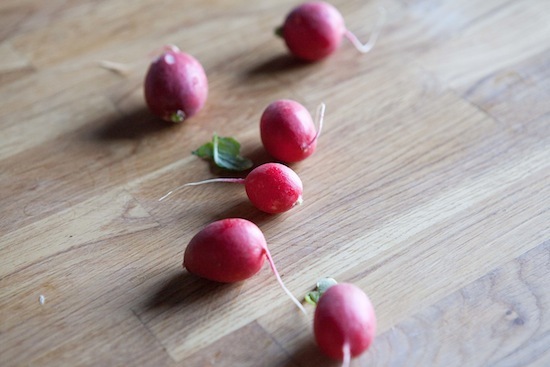 I’m actually intrigued by the radishes; I never think about cooking with them – I usually just eat them raw! 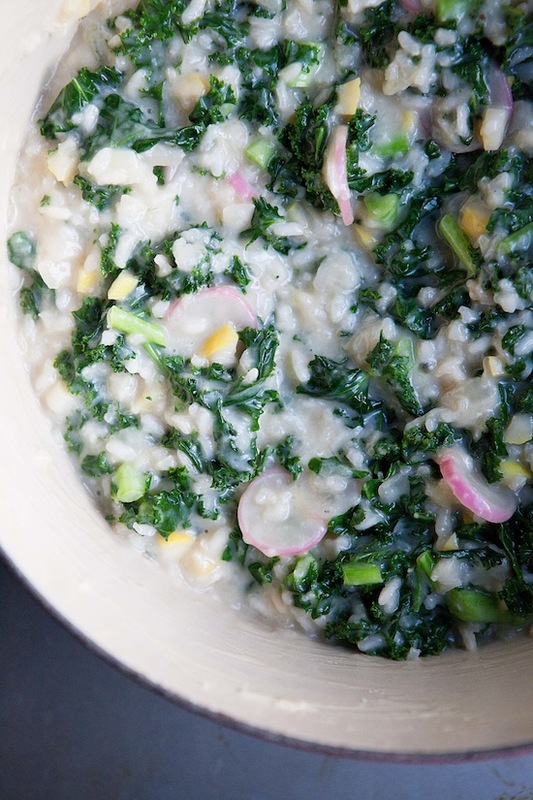 You are currently reading Risotto with radishes, kale, and lemon at Five And Spice.